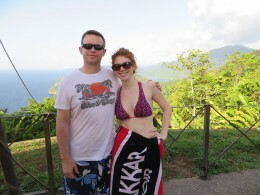 In the blink of an eye our holiday in Trinidad and Tobago was drawing to a close. It seemed like we’d just gotten there and already it was almost time to go back to the US. No matter though, I knew it certainly wouldn’t be my last visit by a longshot. 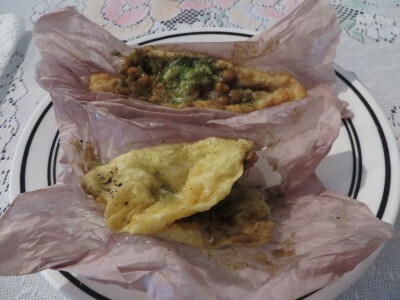 On Friday morning, Sean’s mom brought home fresh doubles and aloo pies for breakfast – with slight pepper, of course. We’d both been craving these almost since the day we arrived, but doubles are really only a breakfast food in Trinidad so many of the shops or carts selling them were closed by the time we were out and about and ready for food. Luckily, I really got my fill that day. The pepper was a little heavy for my tastes (i.e. my tongue was slightly on fire), but it hurt so good just the same. The aloo pie was also tasty as well – neither doubles nor aloo pie are pretty to look at, but damn they taste good! It doesn’t look so appealing, but aloo pie and doubles with peppa. Breakfast of champions. Our final full day was spent just chilling around the house. Chervon was running around doing last-minute errands before leaving Trinidad for the next few months. She was eight months pregnant at the time, so the plan was for her to fly back to the US with us the next day, have her baby in the States, get its US citizenship and passport, then come back to Trinidad afterwards. For planning to be gone for 3+ months, she seemed surprisingly calm and together to me. I’m sure I’d have been a mess in the same sort of situation. This picture pretty much sums up how one feels after many hours of dancing and drinking at Stumblin. Anyway, the day was spent lazily, but the night made up for it. 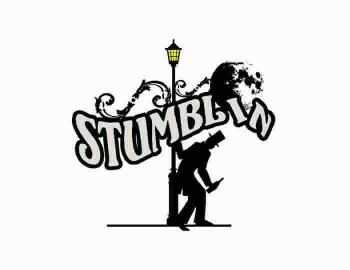 While we were still in Tobago, Sean had sent out a message to all his friends growing up inviting them to a big lime at a bar in Port of Spain called, “Stumblin” (for real), that his friend Doug had recommended. Since it was on the way, Bryan and his wife Annie and Sat picked Sean and I up, and we all carpooled up to Stumblin on Aripeta Ave that night. The gang’s all here. 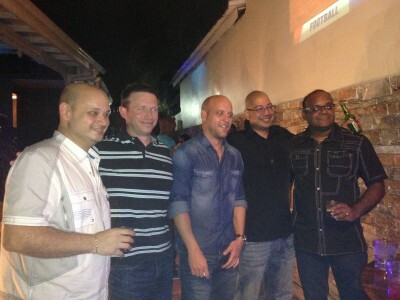 From left: Doug, Sean, Frank, Brian and Sat. Before I knew it, it was midnight (we’d started early that night) and I was starving! Apparently I wasn’t alone. We eventually rounded up our party and said goodbyes to everyone who’d come out to see Sean, and walked out of Stumblin. Directly across the street a doubles man was open and I was all over that. I’m not sure a doubles has ever tasted as good as it did right then. When we walked back across the street post-doubles Sat had ventured into the Chinese restaurant next door, ordered roast pork, fried squid and an order of char siu pork with vege. The best part? He paid with half a bottle of coconut vodka! We all sat down at a table and within minutes two huge plates of steaming fried squid and pork appeared in front of us (plus pepper) and soy sauce and everyone dug in like there was no tomorrow. Once again, it tasted amazing… I could eat it again right now just thinking about it. When Bryan drove us home to the house, predictably, everyone else was asleep and Sean and I didn’t have a house key with us. He banged on his nephew Ethan’s window to wake him up and let us in… Nothing. Sean banged for at least a couple of minutes – enough to wake up his mom and Louie, who opened the door for us, but when he went past Ethan’s bedroom, the boy was still sound asleep! Jeez – he could sleep through a freight train apparently! The next morning I had a headache from the coconut flavored vodka but was otherwise fine. A good shower, pastelles, hops and coffee also helped considerably. Our flight that afternoon was at 3 PM, so we left the house around noon and after a tearful goodbye at the airport for Chervon, we were on our way back to the States. But wait, the fun’s not quite over yet. 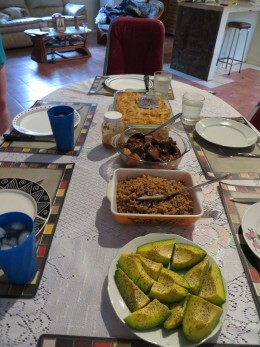 Now this is a proper Trinidad Sunday dinner: stew pork, macaroni pie, fried rice and fresh zabuca! After our totally uneventful flight to Miami, we got to US Passport Control. While Sean and I passed easily with our US passports, Chervon was not so lucky… She got red flagged and disappeared for an hour with an immigration officer to God knows where. We didn’t know what was happening, she didn’t have a cell phone to tell us anything and Sean and I had another connecting flight to Atlanta leaving the airport in just a few hours time. It goes without saying we were more than a little concerned – especially since no one at the information desk, or anywhere else for that matter, seemed to have a clue as to where she was, what was happening or anything else of any use at all. Over an hour later (and just about an hour before our next flight) she appeared! Alleluia! While I hustled our bags over to be re-checked for the domestic flight, Sean got Chervon headed to where his cousin Nicole was waiting to pick her up outside. When we were standing in line at Wendy’s to grab a sandwich before our flight, Chervon called and told us the details, which boiled down to waiting behind a bunch of other people also being questioned, a ton of pointless questions for no real reason, and then typing up said questions – again for no reason that made any sense to me. Way to go, US Customs and Immigration. Bravo. Luckily, that was the last bit of excitement for this particular trip. We reached Atlanta just after midnight, got our luggage (it made it, thank God!) and found a cab home. In all, it amounted to about 14 solid hours of travel. Ugh. Really, is there any way you could not love a picture like this? 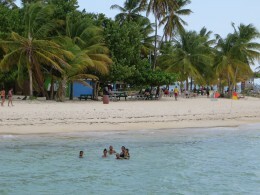 But despite the mosquitoes, the sunburn and the immigration hiccups, I had an even better time in Trinidad and Tobago this time than last. Call me crazy, but that place is awesome. It’s such a special place, and it’s so easy for me to understand Sean’s fond memories of growing up there after seeing it for myself. And the next time we go back? I want to do Carnival! 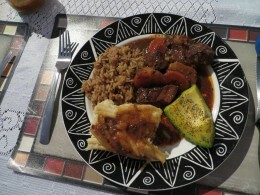 This entry was posted in Caribbean, North America and tagged Bar, Caribbean, Dance, Doubles, Immigration, Lime, North America, Passport, Stumblin, Travels, Trinidad, Trinidad and Tobago on August 9, 2014 by Paige N..